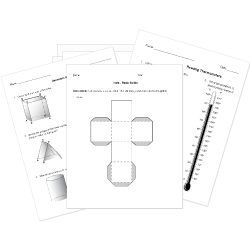 You can create printable tests and worksheets from these Grade 8 Circles questions! Select one or more questions using the checkboxes above each question. Then click the add selected questions to a test button before moving to another page. Line AB is what part of a circle? What term is used to describe half of the diameter? The number value commonly used to represent [math]pi[/math] (pi) in equations. The length of the radius is one half the length of the diameter. Suppose you are constructing a circle graph. What is the angle measure of a piece that represents 40% of the total? Name the part shown on the circle. Grandma has an old family recipe for blueberry pancakes. She can make 8 pancakes that are each 10 inches in diameter. Grandma decided that the pancakes were way too large for her grandchildren and decided to make pancakes that were only 2 inches in diameter. About how many small pancakes will Grandma's recipe make? Half the distance across a circle is the radius . A line that touches a circle at only one point is a . Collection of all points equidistant from a point is called a circle . 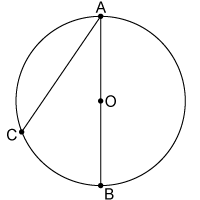 The length of the radius is one quarter the length of the diameter. What is the term used to describe the total distance of the outer edge of a circle? The point that is equidistant from all other points when creating a circle is the center . What is the term used to describe the distance from one edge of the circle to other, passing through the middle point? Suppose you are constructing a circle graph. If you have a central angle that measures 120 degrees, what percent of the whole does the central angle represent?